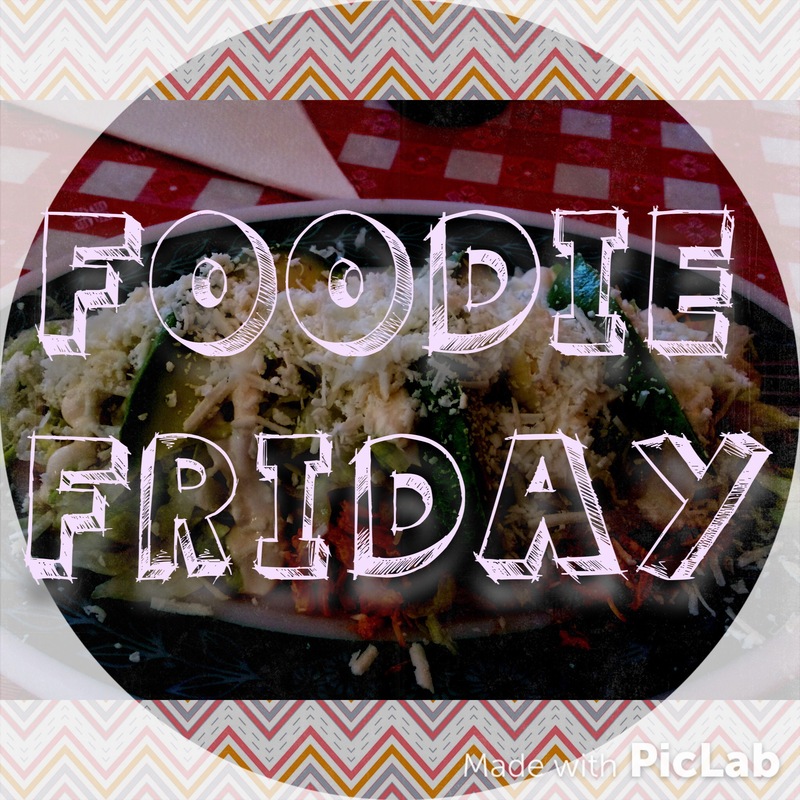 It’s time for Foodie Friday! If you are not familiar with Uptown Greenwood SC, you probably are unaware that Inn on the Square is re-opening. Or what a big deal that previous statement is. It was about 5 years ago that Inn on the Square closed. This was unfortunate for many reasons but mainly because it is in a prominent place in Uptown Greenwood. It needed to be occupied and opened. Earlier this year, the new owners said that they beginning renovations and were opening this fall. Date was set for October 1st. They hired Claire Griffth as the Events Manager (best thing they could have done in my opinion) and she began furiously working to make sure everything was in place to open without delays. On Sept 25th hubby and I were invited to be dinner guests while the chef and kitchen staff tested a few of their menu items. When we arrived, we were told we could go the Fox and Hound lounge for a drink while we waited for our table to be arranged. When we walked inside, I felt like it was classy, but in an unpretentious way. 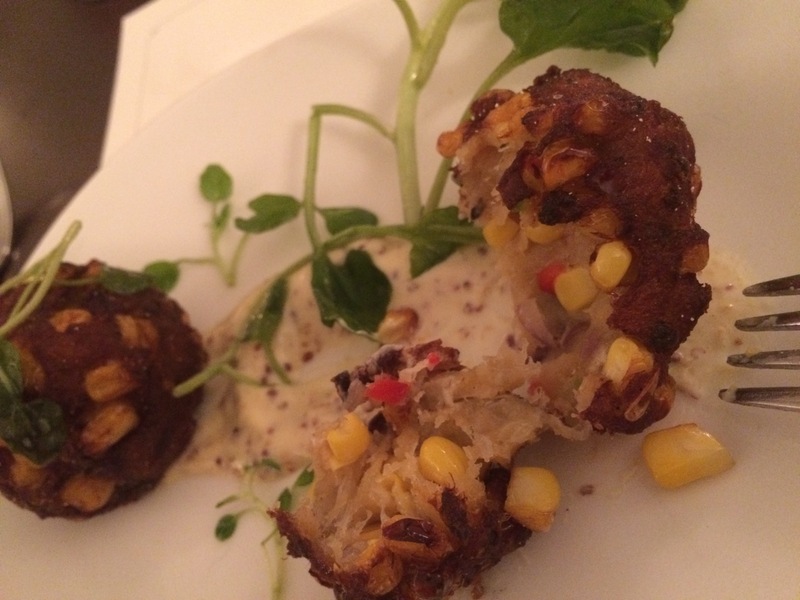 Lump Crab Fritters (I ordered) – these were about the size of a golf ball. Lots of lumps of crab and corn. Crispy to perfection on the outside. I want this again. I told the chef that is going to be the first thing I order when they open. Pulled Chicken Spring Rolls – comments at the table were that these were outstanding. 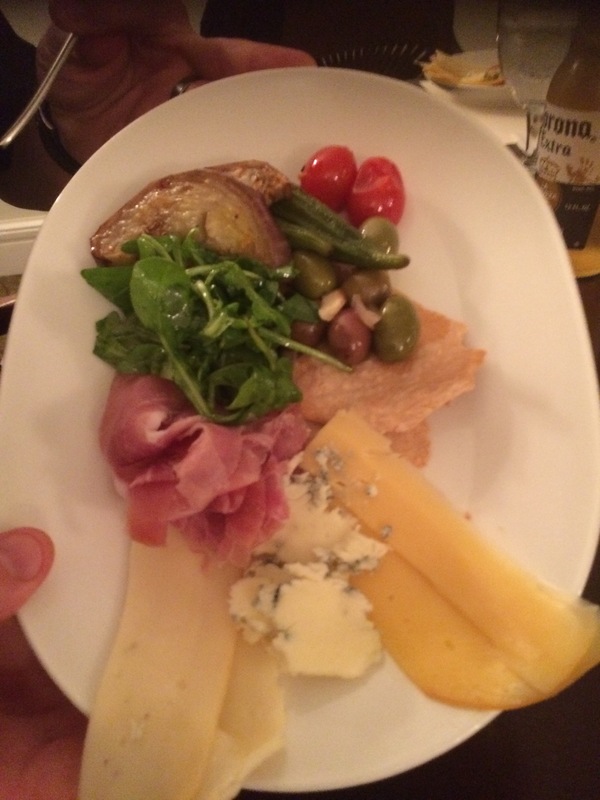 Antipasto Platter – comments at the table were that this was delicious too. I wish I could have ordered this as well as the crab fritters. Argula and Apple Salad (I ordered) – Delicious! 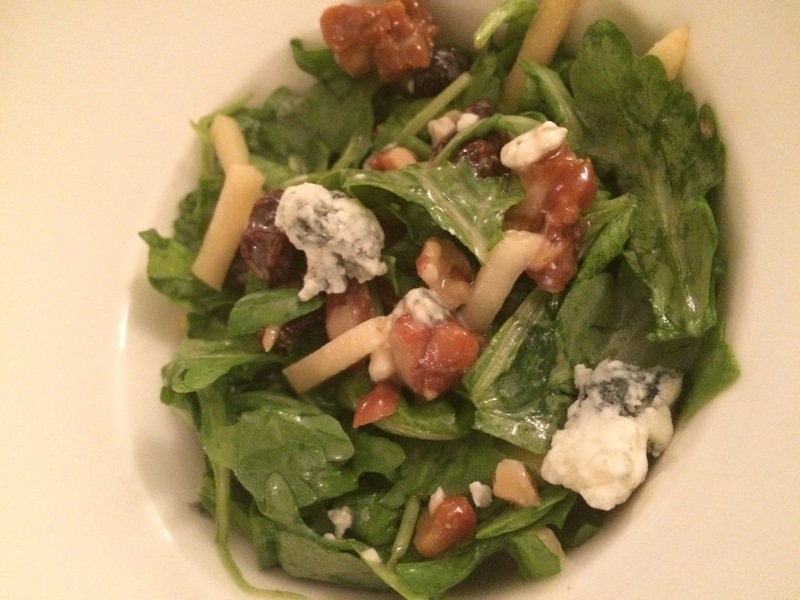 Arugula, lettuce greens, apple, candied walnuts, raisins, and blue cheese tossed in apple cider vinaigrette. My kind of salad. The bite of arugula paired well with the apple. The walnuts added crunch. While the blue cheese added a tart creamy flavor. 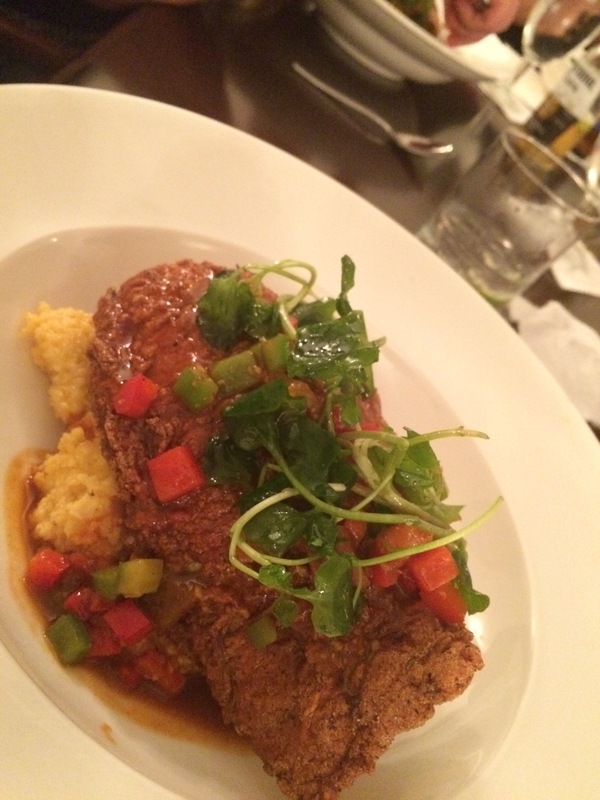 Catfish and Grits – I tasted the fish and LOVED the breading mix because it was really crunchy but the fish was light and flakey on the inside. I do not prefer to eat grits, but my friend said those were good too. 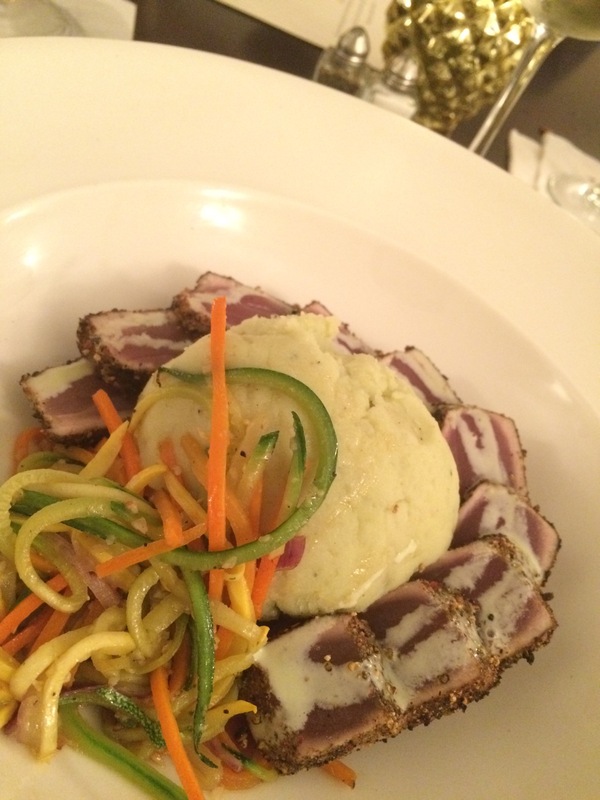 Peppercorn Tuna (I ordered) – Peppercorn tuna is one of my favorite dishes. I like a lot of peppercorns and this was prepared the way I like it. It was served with wasabi mashed potatoes. Genius! Not very spicy, but there was enough of the flavor there to know there was wasabi in it. 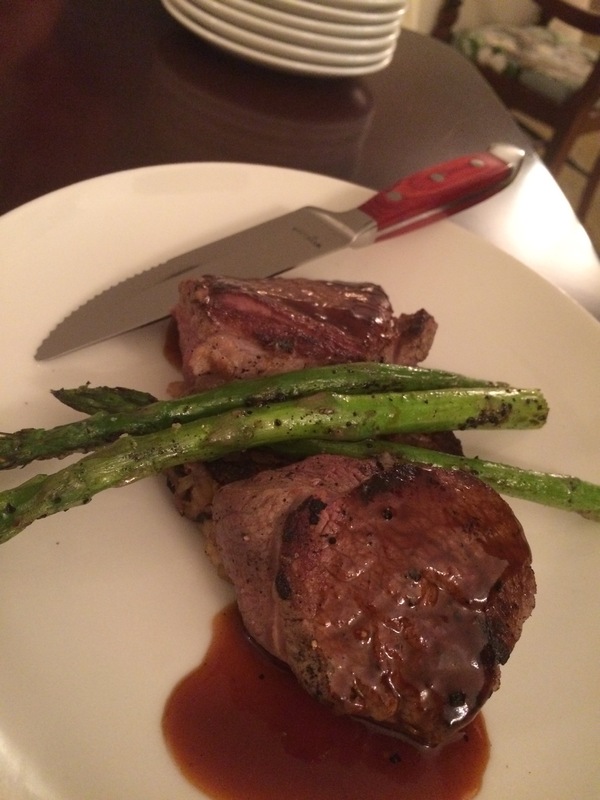 Pan-Seared Sirloin – Hubby said this was the best sirloin he had. He ordered medium rare. 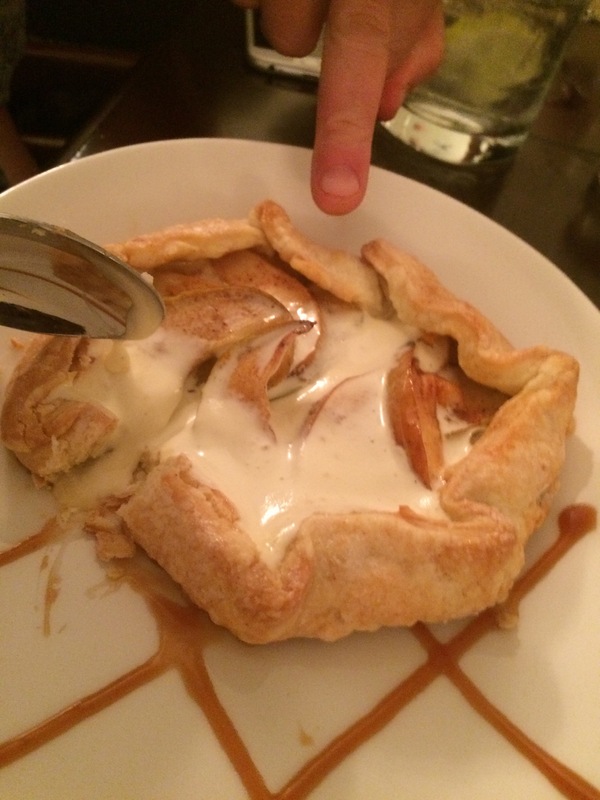 Free formed apple tart with caramel sauce – I liked this but wish there had been more caramel sauce. Tasty! 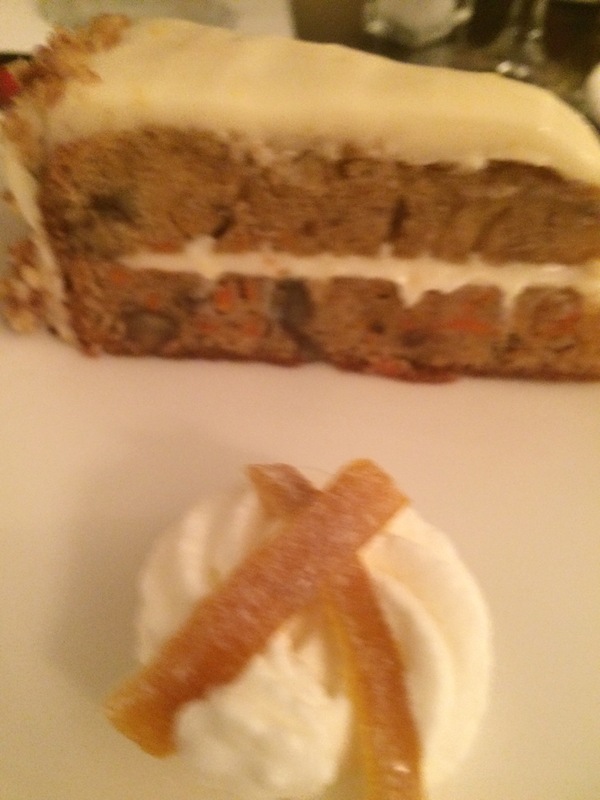 Carrot cake with cream cheese frosting – This was a little dense for carrot cake, but the flavor and frosting was good. 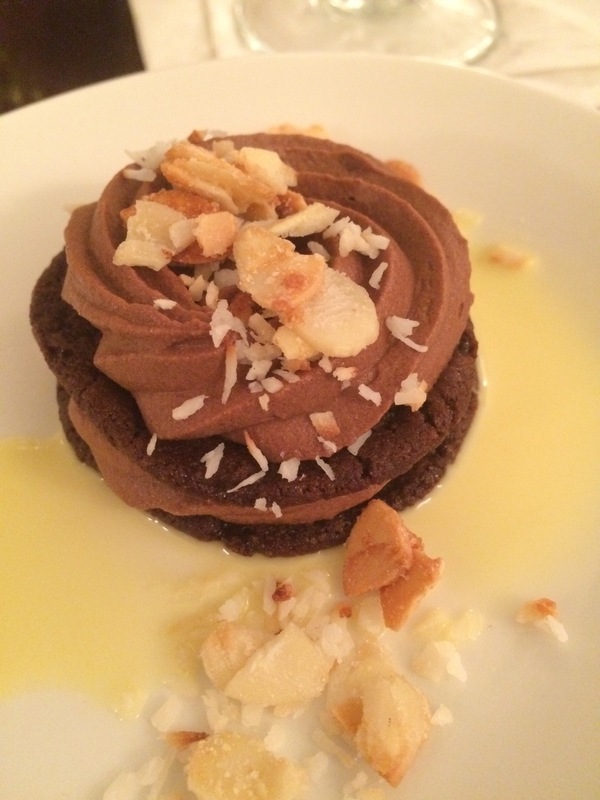 Almond Joy inspired mousse (I ordered) – I tasted all of the desserts and this was my favorite. It was chocolaty and creamy but not super sweet. Happy Foodie Friday! This is a meme I am doing to share my fave dishes and everything related to food. Today I am going to talk about one of my favorite things to order when I go to Montague’s. Of course, you probably know that Montague’s is my all time favorite restaurant in Greenwood, SC. I love it. The people are nice and attentive. There is a great atmosphere. Having a good personality will only get you so far when it comes to food. Montague’s knows how to deliver. My comfort food when I do not know what to order is the chicken Parmesan. I do not know if it is the sauce, the cheese, the angel hair pasta, or the chicken that makes this my favorite pasta dish. Everything about this dish is good. AND the portion size is HUGE! I can eat two meals off of this one plate of food. I have heard people say that Montague’s is pricey, but I do not get it. This is a super affordable dish and when you factor in the portion size, it is a double win. 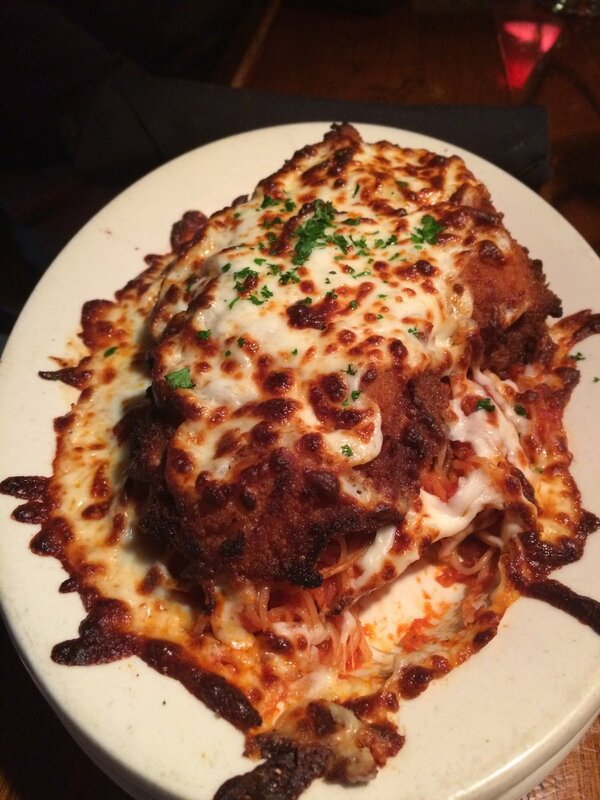 TOW opinion: Go to Montague’s and order the chicken Parmesan. Delicious. I have come to realize that Montague’s is my favorite restaurant in Greenwood. As much as I would like to say, I like all my local restaurants equally, when it comes to fine dining, my go to place is Montague’s. While all of the waitstaff and crew do a fantastic job, I think that TJ’s efforts over the past few years have done a lot to change my perception of the restaurant. I used to think that Montague’s was a stuffy place with an air of pretentiousness . In retrospect, I was rating the restaurant, not based on my own experience, but on what I knew of type of people that frequented the restaurant. I am glad that I saw the error in my judgment. My taste buds are delighted like this. There is a seasonal menu as well as some restaurant favorites. There is also a weekly menu feature that the chef creates based on what ingredients are available. He uses a lot of produce from local famers. I think that is one of the reasons why the flavors are so rich and complex. While I could probably do a post a week about the different dishes I have ordered, this post highlights some of my favorite dishes over the past 6 months. You will be able to tell from my food selections that I like trying new things. If you have not been to Montague’s, I think you owe your tastes buds the experience. Prices are comparable to chain restaurants like O’Charleys and Outback but the food is way better. When I go to Montague’s, I try to get there by 5:30- 5:45pm so that I can get at least one or two drinks at Happy Hour prices. Happy Hour is from 2- 6pm. House liquor drinks and cocktails are half off and there are specials for beer and wine as well. I usually do a screwdriver, pineapple+vodka, cranberry+vodka, or skittle-tini. Nothing fancy, but something to begin the evening. If it is Wednesday (Ladies’ night), then I will split a bottle of wine with a friend. Select bottles are half off all night. Rufino Pinot Grigio (pictured below) is one of my favorites because it is light, fruity and goes well with fish and chicken. While I am sipping on my drink, I mull over the weekly menu features. So many options. If only my stomach was bigger. Hands down my favorite dish EVER at Montague’s was the BBQ salmon (BBQ sauce was more like a tomato gravy) over mashed potatoes. This is comfort food at its best. The salmon was perfectly cooked so that the meat was tender and moist. The tomato gravy was a little sweet with a hint of onion flavor. The handmade mashed potatoes were firm enough to be the proper conveyance for all the gravy. Mmm mmmm mmm. 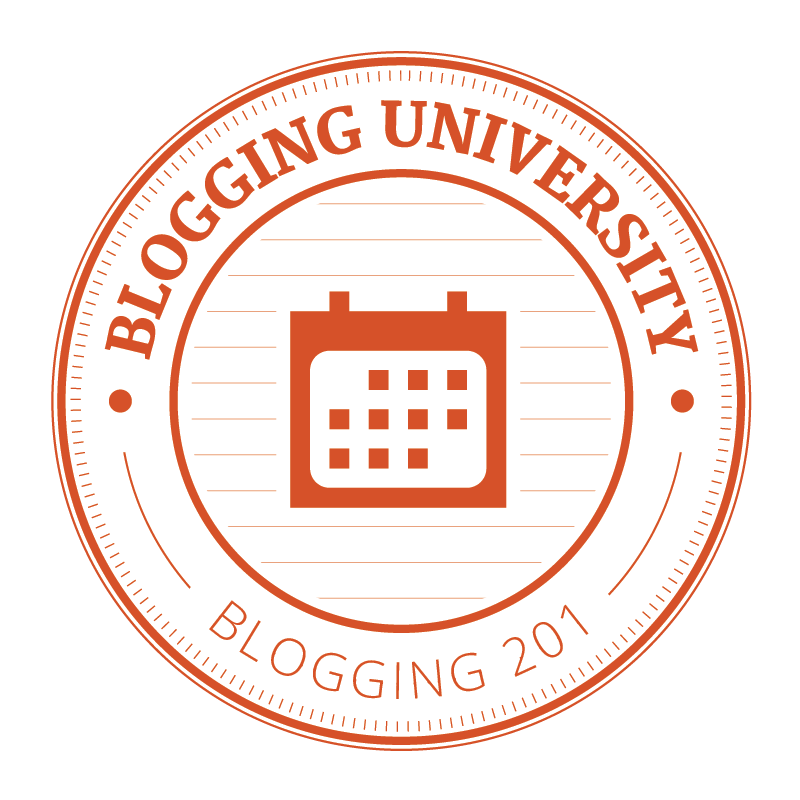 Just looking at the picture makes me reminiscent for that tomato gravy. If you ever see the Scallop mac and cheese on the menu, you should order it. Chunks of scallops and creamy cheesy goodness. What else to you need? If you like fried green beans (yes that is an actual dish), then you will love fried broccoli. It is the same concept. The broccoli is tossed with flour seasoned with salt and pepper and then fried (I’m guessing that is how it is done). The broccoli still has some firmness and crunch. Best way to get my daily serving of veggies. I ordered the potato fritters on night because I was curious to taste the sweet relish. This was not the standard relish you might get for your hot dog. This was classy. It tasted freshly made with sweet peppers. The light vinegar helped to balance the fried potatoes. If you like vinegar with your fries, you would have definitely liked this. If you never tried vinegar with your fries, you are missing out. The stuffed pork chop with green beans and mashed potatoes was good. 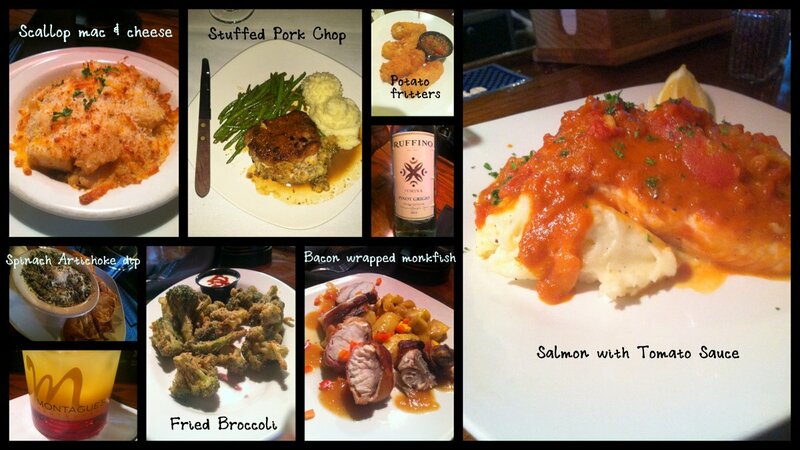 This is a tasty dish but I do not have that much to say because I am still dreaming about the salmon with tomato gravy. Bacon wrapped monkfish with fingerling potatoes was also quite tasty. But then again, bacon wrapped anything is good. This was my first time having monkfish. I like the texture, as it is firm white meat. The flavor is mild and paired well with the bacon. Although, I was too stuffed to eat all my fingerling potatoes, they were delicious too. Last but not least, spinach artichoke dip is my go-to appetizer when I do not want to try anything new. A bowl of hot, creamy spinach artichoke dip is full of chunks of artichoke hearts. I love to eat marinated artichoke hearts. Having them swimming in cheese and spinach only makes it better. The tortilla chips are fried to order and lightly salted. Can you tell I am a fan? Team spinach artichoke dip. A couple months ago, I went to a wine tasting at the newest wine and beer establishment in Greenwood SC. The couple that owns this store are passionate about what they do. The husband loves specialty beers and the wife loves good wine. With Flynn’s on Maxwell, they have an avenue to talk about their passion and explain flavored nuances of many libations that they have discovered. I attend wine tastings because it gives me a chance to try wines that I would otherwise not buy. Over the years, I have found that I do not like many reds because they are usually too dry for me. I am an ultra sweet moscato or Riesling type of girl. However, I will try new red wines to see if I can find one that l like to drink. The wines talked about here were ones that I tried during the June 2013 tasting. 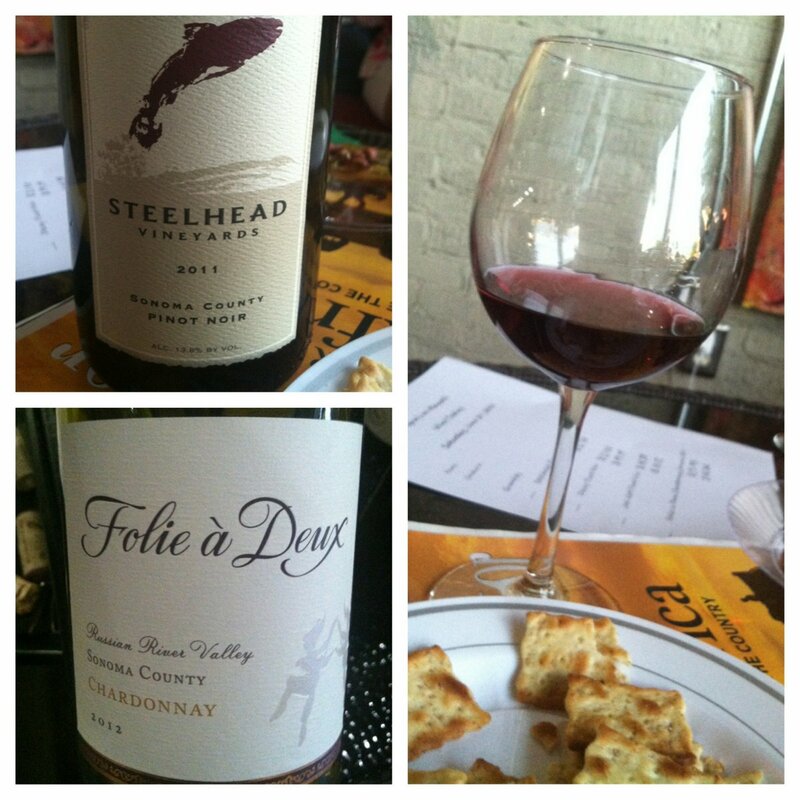 Steelhead Pinot Noir – $14.18 – Dry wine with strong flavor. I was not a fan because I do not like dry wines. I felt like I had cottonmouth. Decoy Pinot Noir – $21.32 – The aroma of this wine was better than the taste because it was dry too. The aroma was rich, full body with an earthy, leather, tobacco smoke flavor. I loved smelling the wine but the dryness took all the taste out of my mouth. All the people there that like dry wines were raving over this one though. Folie a Deux Chardonnay Sonoma RRV – $15.93 – My favorite of this tasting session. It was light and fresh. I ate with some grapes. I wish I had had some strawberries though. It felt like summertime at its greatest. Since everyone’s palate is different, the reason I do not like a wine could be the same reason another person wants to try it. If you like pinot noir wines, you might enjoy Decoy Pinot Noir. Like I said, the people who did like Pinot Noirs said it was delicious. If you are looking for a nice chardonnay, I do recommend Folie a Deux Chardonnay Sonoma RRV. It was really tasty. I do not DO mornings, especially on weekends. I do not DO cold. But on a cold Saturday morning in February, I was up and dressed by 7:30. When I say "cold", I mean water was freezing. The thermometer showed 28 degrees. I thought that I was crazy. But there was a reason for my madness. 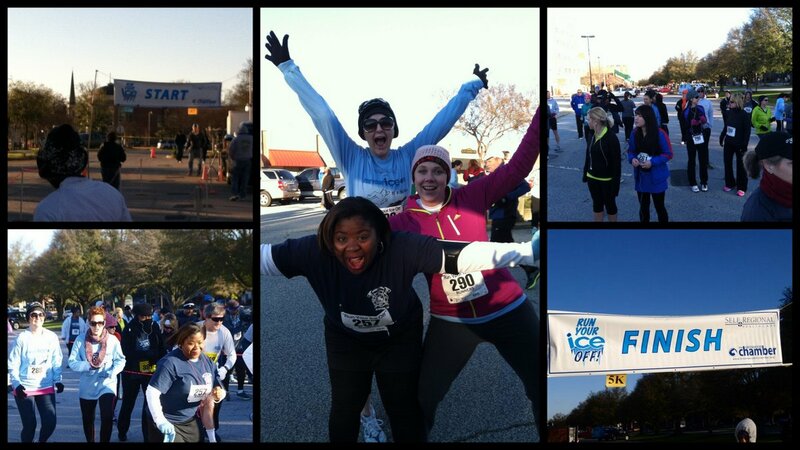 I had decided that in 2013, I was going to run/walk in a 5k. It was my "good health" personal goal for the year. I was resolved to participate. No matter the temperature. It is my opinion that when you set goals, if you begin to make trivial excuses, it is harder meet the goal. It is better to make every effort to do it and then you have achieved something you wanted to accomplish. Once I registered online a couple weeks before the race, I knew I had to do it or lose my money. Checking in was easy. I got my t-shirt and little gift bag, which I put in the car. I saw some friends and we chatted in high pitched voices indicating our excitement. 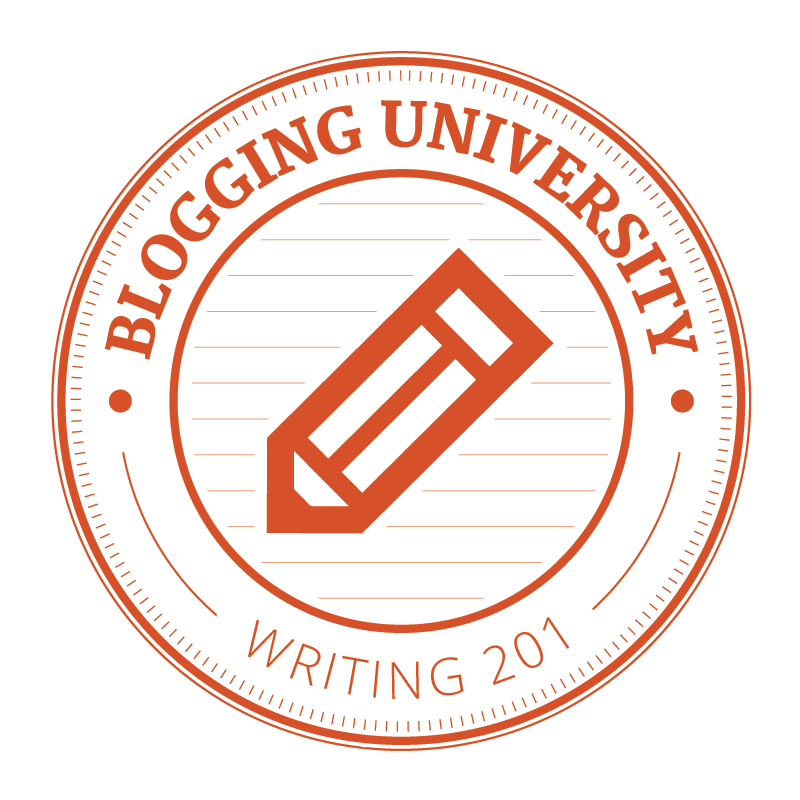 As I made my way to the starting point, I was anxious to begin. I was bouncing, shifting my weight from one foot to the other. I saw people stretching, so I figured I better do that too. That helped calm me down. And then I began to feel the cold on my ankles. I went back to the car and put on my extra pair of socks. Hubby was supposed to come out and I was feeling a little despondent because I did not see him. But then, like a beacon of light, I saw his car pull up. It gave me renewed energy. He is a great supporter of whatever I do. By this time, it was getting close to 8:00 am. Runners began to gather near the starting line. Time to do what we came to do. Run this race. 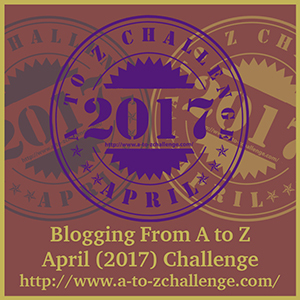 I was like a shot out of the gate, but within probably a quarter of a mile, I began to go at my regular stride. I knew that if I wanted to finish, I needed to pace myself. I had only been training for about a month, so I knew I do not yet have the endurance to run the whole 3.5 miles. I found that I run best when I kept my eyes closed. I focused on the movement of my feet hitting the pavement. Two friends were running alongside me, but they both have longer legs so I had to take two steps to their one if I wanted to keep up with them. I thought that I would have my iPod blasting with music to keep me pumped up, but the ear buds kept falling out of my ears. In the end, I talked a little with my friends when we walked. When we were running, we yelled encouraging phrases at each other to motivate: "KEEP IT UP!" "YOU GOT THIS!" "WE ARE ALMOST FINISHED!" When we saw the finish line, the adrenaline kicked in and we gave all we had to run that last little bit. My ending time was 48 minutes. I did not win, but I did not come in last place either. That was my goal for my first 5k. I had fun with good friends. 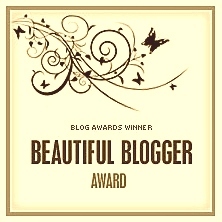 Most importantly, I proved to myself that I could do it. This was a great first 5k race for me. I recommend anyone who wants to exercise to participate. The race is usually the couple of weeks first of February in Greenwood SC.